A full scooter maintenance and repair workshop is available at our showroom in Barnsley, South Yorkshire. We employ two full time, highly skilled and highly qualified mechanics who can perform a full range of repairs from a simple tyre change to a full engine re-build. Repairs are competitively priced and we can also offer scooter MOT's. In addition to this we can carry out accident insurance quotes and repairs, getting the job done to the highest standard and in a reasonable timeframe. With access to the full parts range for all the models we sell we can also partially work on your scooter and then supply parts for any work you feel you can do yourself to cut down on costs. 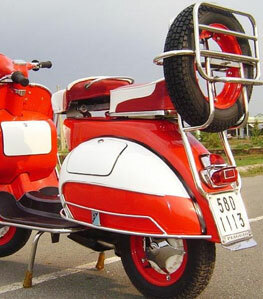 To book your scooter in for a repair, MOT or quote you can either email us or call 01226 203377.